In a dead rubber, India take on New Zealand at Hamilton, a test wherein both the teams would look to test their bench strength before the 2019 Cricket World Cup. Although India are 3-0 up in the series, yet they won’t provide an easy ride to the home side. The hosts on their part would need to up their game in order to save their faces from being whitewashed at home. India are expected to play both Kedar Jadhav and Dinesh Karthik in the middle-order as Ambati Rayudu would be forced to come in as a number-3 in place of the rested regular ODI skipper Virat Kohli. It seems like Shubman Gill would have to wait further for his ODI debut, given India would try to give Dinesh Karthik more chances to prove himself in the middle-order. Mohammed Shami might also be rested, and in his place young southpaw Khaleel Ahmed might get a nod to prove his worth and further stake a claim in the World Cup squad. New Zealand are almost certain to play Jimmy Neesham in place of Henry Nicholls, who hasn’t fared well in the series. Also, Todd Astle is expected to play in place of Ish Sodhi. Further, the Kiwis would have to make some bold call regarding their underperforming openers, especially Colin Munro who has struggled a lot in the series. Tom Latham will be a wise choice instead of the southpaw since Latham has played as an opener and excelled in the spot in the past too. Middle-Order back in form – Although the Kiwi middle-order hasn’t clicked together, yet bits of individual performances have hinted that the Kiwi middle-order batsmen haven’t lost their form and rather have played some reckless shots which has led to their downfall. Kane Williamson had scored a half-century in the first ODI, and the duo of Ross Taylor and Tom Latham reached to their fifties en-route to a superb 119-runs partnership in the 3rd ODI, which further validates this point. Under-performing Openers – The Black Caps openers have not been in form in recent years. Although Martin Guptill has just returned after a lengthy layoff due to injury, he hasn’t been able to score runs except for one innings against Sri Lanka. Colin Munro, on the other hand, has been underperforming since a long time and the Kiwi selectors would have to make some harsh decisions where they would have to call either for or against the left-hander, considering the World Cup is just a few months away. 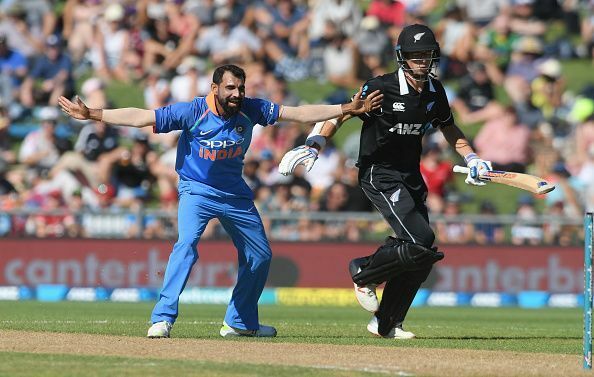 Inability to pick-up wickets – The Kiwi team possess some top-notch bowlers; however, they are unable to pick up wickets in the present series against India. In the entire series, the bowlers have picked up just 9-wickets, averaging 3 wickets per match; and if New Zealand are to win the fourth ODI, then their bowlers would have to pick up more wickets and restrict the Indians to a mere total. Bowlers picking up wickets consistently – In this series, the Indian bowlers have picked up all 30 wickets out of the possible 30, and this has been one of the major reasons why India has dominated New Zealand throughout the series. The Indian bowlers have not only picked up early wickets but have also picked up wickets in crucial and regular intervals and thus have restricted New Zealand to low scores. Top-Order providing a solid foundation – The Indian top-order batsmen have provided their team with solid start consistently throughout the series and this has, in turn, led the Indians to post an above par total in the matches. The Indian openers, Shikhar Dhawan and Rohit Sharma have both hit two fifties in the series, while Captain Virat Kohli, has returned with 1 fifty and two 40+ score in the series, thus helping the Indian middle-order batsmen to take their time and perform well. A selection headache: With Virat Kohli being rested for the remainder of the series, it will be interesting to see whom the Indian camp would give a nod to replace the skipper in the Indian team. Shubman Gill is a quality batsman who can easily slot himself in the number four role, or even the number three or opening role, however given that Dinesh Karthik hasn’t done anything wrong in the entire New Zealand series or even in the Australian series, he is more certain to get the nod ahead of Shubman Gill in the playing eleven. Team CricWizz predicts that even though India will be playing with a couple of their bench players, yet given the kind of bench-strength they possess, they are more likely to win the match and go up 4–0 in the series.